It’s the holidays so it’s time for our Bramble Berry Holiday Tradition: Salvation Army Family Adoption. Bramble Berry Inc. adopted eight families this Christmas season. Eight years and counting, the Bramble Berry staff donates their time (and the CEO’s money!) to help less fortunate families during the holidays. Kristin in Processing with a cart full of presents! We’re extremely grateful that we’re able to share some holiday cheer with those in need. It’s a fun bonding experience for the entire team (whom we affectionately call ‘Brambleberrians’). You can’t help feeling warm and fuzzy inside. There’s generally tears shed by at least one or two people on staff every year. 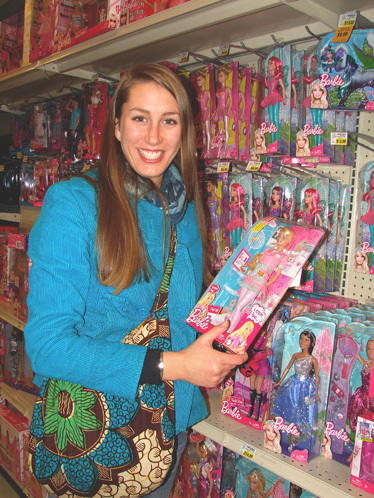 Leah in Customer Service deciding on a perfect doll. 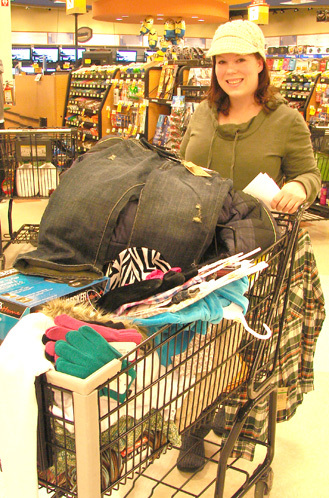 As the Bramble Berry holiday tradition continues, we shopped for 20 children and 17 adults on December 14th, buying warm clothes, food, toys and Christmas dinners, sure to bring smiles on Christmas day. 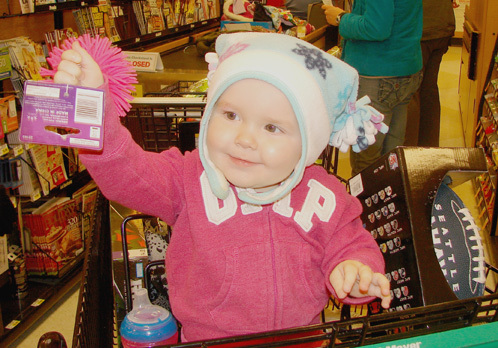 Baby Braiya (belongs to Katy in Pulling) helping pick out toys. Last year Bramble Berry was able to buy presents for over 20 people. With the increased budget and more people to buy for, the staff split up the family members and disperses through out Fred Meyers. We end up with a receipt as tall as an adult and a check out line around the corner and then several people always blink back tears. Fred Meyers participates in the fun too by providing an expert checker, opening up a special lane. That helps a lot! 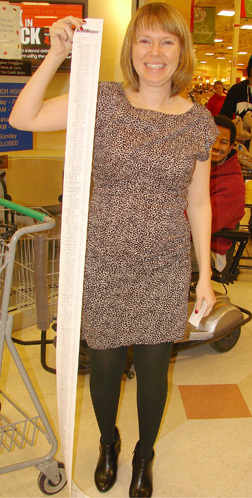 The receipt is as tall as me (in heels)! See The Salvation Army Bellingham Corporation for donation information. That is awesome! I love seeing that. And Lori, if you’re in town, you are ALWAYS welcome to come shop with us. We would love the help =) This year, with so many people to shop for, everyone got 2 people (minimum). I love this Bramble Berry tradition and miss being a part of it. Did you see the article in the Bellingham Herald about a recipient? Thank you. We couldn’t do it without our fantastic customers. It is a really nice sort of general, all purpose show. I guess it would be considered a competitor to Wal-Mart or Target? Sort of a mix of the two. It works great for us because we can get the food gift certificates AND all the actual tangible presents at one place. I LOVE that idea. I haven’t read that book before so thank you for summarizing the idea. I told my husband about it and he definitely likes the idea for our family. My folks always did a great job instilling a sense of giving back for us and this sounds like a great thing for us to do with our little one (hopefully, eventually, little oneS!) for a tradition. Thank you for sharing. =) Thanks. We couldn’t do it without our customers! Aw thanks. We’ve always donated a portion of our profits to worthy non-profits since we were founded 13 years ago. It definitely is one of the best part of owning a business. I think that must be one of the most gratifying parts of having your own business- being able to give back to your community in such a hands on way. Great Job! I love that guys do this. Its just another reason on an already long list of reasons why I shop at Bramble Berry. Just a quick note to say ‘good news’ for less fortunate in your area that you are so generous. If more of us were as good hearted and free with giving of our money the world would be a better place. It truly is all about the ‘giving’ especially of ourselves and our time that makes for a better world. Thanks for sharing. I salute you and your staff for your efforts. Your CSR rules! That is so awesome that you do that every year! We started a tradition a few years ago after I read the book “Christmas Jars.” If you haven’t read it, it’s a great book, with a great message! We have a jar on our kitchen counter year round, and we put our change in it every day, sometimes a few extra dollars. Then we anonymously drop it off on someone’s doorstep who we know is in need, a couple of weeks before Christmas. Even my 7 year old likes to put some of his allowance money in it every so often. It gets the whole family involved in giving, not just receiving. My kids say that it makes them feel good every time they put even a few coins in that jar. We usually end up having around $300 or so, and it’s fun to deliver it in change and bills, it makes the receiver have the fun of seeing how much is really in there! I wish more companies like yours would get involved, and do something for families at Christmas, or any time! It looks like you and your employees had a great time!! It’s really cool that you give them the opportunity to participate in such a feel-good project, and giving your awesome soap and other products is the icing on the cake!! Too cool! We do not have Fred Meyers here in CA. I heard of Fred Meyers by watching Little People Big World. I am going to miss that show! Wow. It’s so wonderful that you guys can do this. I think it’s wonderful that Bramble Berry is able to do this every Christmas!! I always get teary when I read your blog post about it. Wow! That’s an impressive load! This is a great tradition and always adds to the good feelings I have for everyone at Bramble Berry.